Katelin’s ‘What We Love’ is up and oooooh trouble!!! 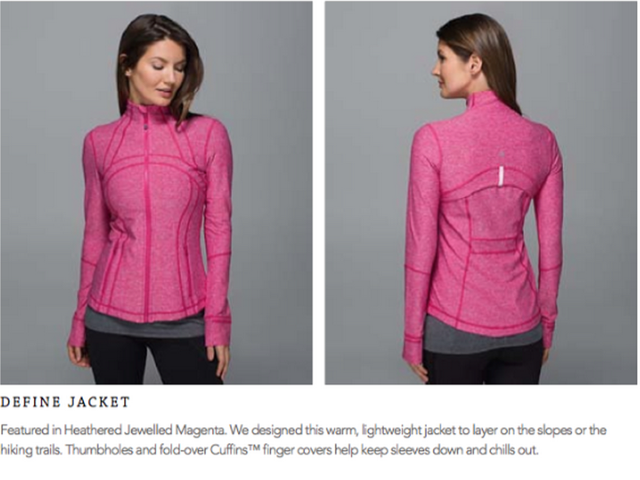 I’m loving this Heathered Jewelled Magenta Define Jacket. That is a must for me. I’m also loving the color Iris Flower. 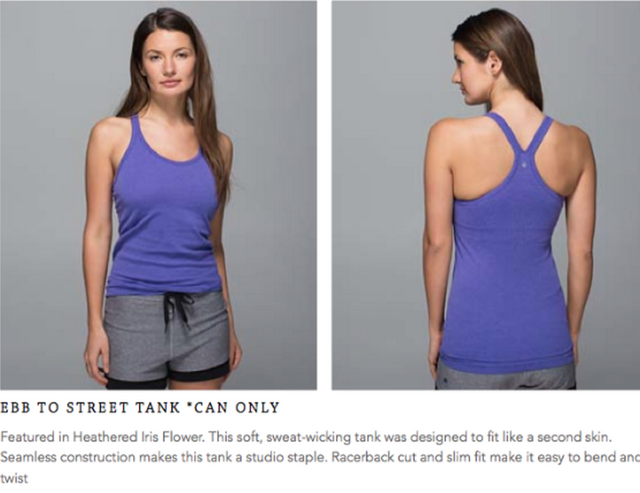 I don’t think I want the Ebb To Street Tank but if it comes in a Cool Racerback I am definitely in. 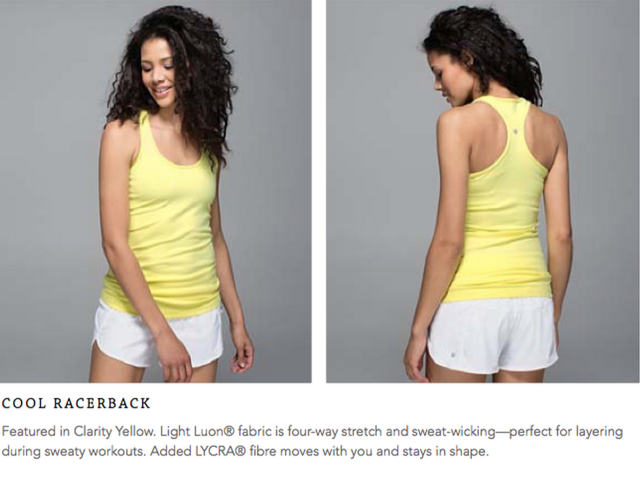 Clarity Yellow interests me too and that Cool Racerback is a maybe. Posiedon is a gorgeous blue too. I noticed it in the socks uploaded on Tuesday. 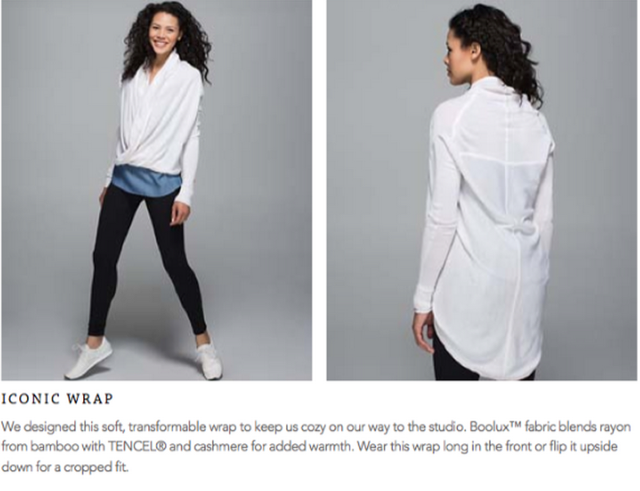 "Lululemon Summer 2015 Sneak Peek Video"
"Lullaby and Sea Spray Run Swiftly Tech Racerback Color Pairings"
I must have that Define! It is so pretty! OMG – cha ching! 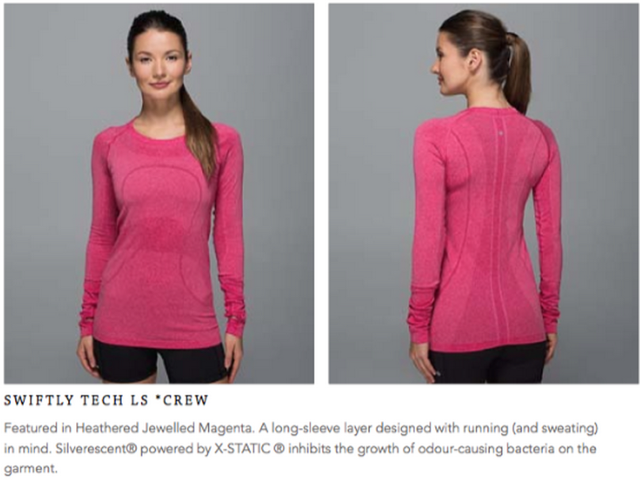 I love the jeweled magenta swiftly – hope it comes in short sleeve or CRB or SRB – that would be better. Same with yellow and iris purple….the warrior tank looks almost alberta lake colour – a bit fall/winterish for me. I have to decide if I am keeping the high times multi wave and the heat wave crops – this is gonna be an expensive spring/summer. I have the sculpt in multi print but not sure i want print in 2 items as I get sick of it and there is always new stuff coming out. Same with heatwave, have the CRB – I am thinking the heatwave and multi colour look better as bottoms – and iredescent for that matter. I guess because solid colours look good to top with them?!?! I'm with you. I think I'm returning the Pigment Multi Tracker III shorts and Sculpt Tank and just keeping the Inspires and the Stuff Your Bra so that I can get that Define. 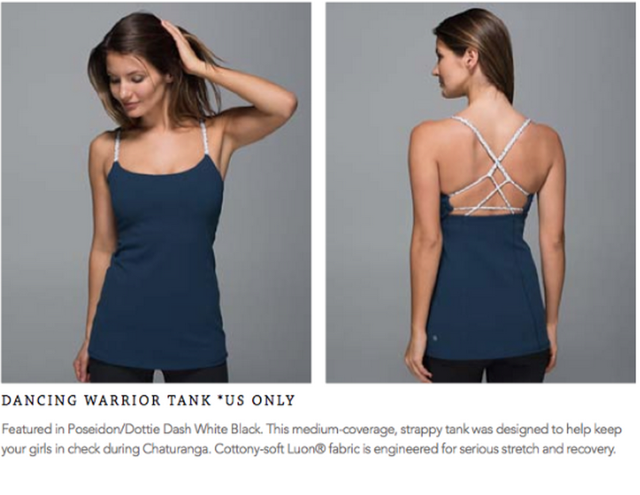 The Warrior Tank does look fall, but I bet you paired with a creamy white it will look more nautical spring/summer. I think Lulu Addict had a photo up today of the Jewelled Magenta Swiftly SS. It came up on my newsfeed but I didn't grab the photo right away but I'm pretty sure she's got it up. I just noticed the ss swiftly in magenta, though she says it is rugby stripe which means lighter coloured – not as rich as the ls seems to be. 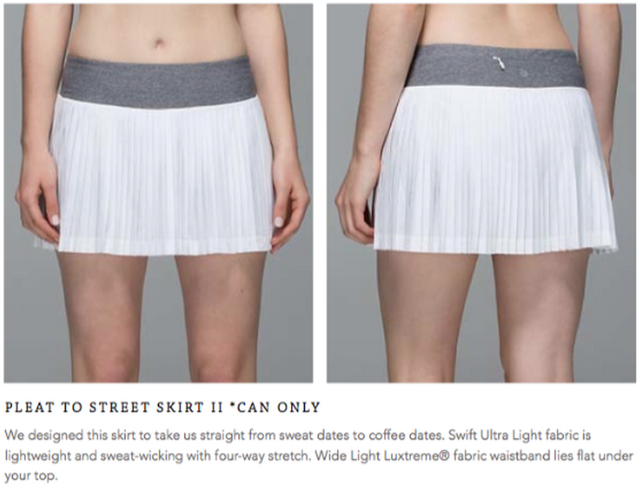 Does anyone else find the pleat to street skirt gets caught between legs when running? I have bumbleberry and navy and just returned the black I had gotten back in winter for that reason. The tags were still on and they took it back no problems – but I think I made someone very happy because those sold out and weren't available in my store. I do find the Hit your Stride to be much better for activities! LLM Do you find the Ebb & Flow bra TTS? Supportive enough for running? I do find the Ebb and Flow Bra TTS. For me it is supportive enough for running (I'm a 36B) and most comfortable but it's stretchier than an Energy Bra. While it is great for running I have found myself a bit jigglier in the E&F doing jumping jacks at crossfit where as I might not have been in my Energy Bra. Oh no! More trouble for me too. Loving the new define jacket, (a must for me too as its my favourite) and the lullaby swiftly tank a must as well. Also, I have several Iconic wraps and love it too. Gulp! LLM, do you think we will ever see the Cyber strip silver fox high times????? Or is there anywhere I can ask (or complain!) as every other country has had them but us!!!!! Hi! I just found your site – so helpful! I also just started to work out again and am becoming a little bit addicted to lululemon! Of course, the tops I like the most are seasonal and very hard to find- the ebb to street and ebb and flow. I am in the U.S. – would Canadian stores ship to me? How can I know when/if these tops will be coming back seasonally? Thank you for any advice and I apologize for posting as anonymous, but google will publish my full name other wise. Nina R.
So glad you found me. Welcome! If there is something on the canada side you are dying to get, a lot of people request 'angel' help in the comments here and find a buddy willing to let you borrow their address and forward to you. You can trycalling a Canadian store to see if they will ship but I think they may only ship within canada. Worth calling and asking though.